As we know Panasonic has released the Lumix LX100 Mark II. This camera is the second generation of Panasonic pocket cameras. From the outside view LX100 Mark II is very similar with the previous series. With the addition of several custom buttons and the grip part that is more tight. The price of this camera is 999 US dollars. And it includes a small external flash unit. What’s New from Panasonic Lumic LX100 Mark II? What is Same as The Previous Series? This camera has a 3 inch (1.24 megapixel) LCD screen. The back of the LX100 II now has been supported by touch input to facilitate operation. 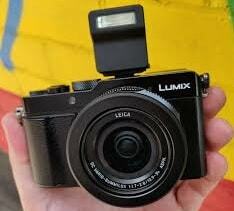 In addition, Panasonic also enlarges the LX100 II buffer. So, it can accommodate 33 RAW images. This camera has 11 FPS burst rate or 5.5 FPS in continuous AF. There is also the ability to charge the camera with a USB connector that is plugged directly into the body. Based on the Panasonic website, the Venus Engine utilizes an ultra-high resolution from Lumix LX100 II. So, it can reproduce photos with sharp contrast. Besides, it produces expressive colors, and realistic textures. Without a low-pass filter. So this camera is designed to produce amazing image quality. This camera also offers a full hybrid photography experience. It is equipped with 24p / 30p 4K video capabilities and exclusive 4K photo mode. Other features are focus buildup and 4K pre-burst. Lumix LX100 II presents an enhanced photo capture mode. This series is also equipped with bluetooth 4.2 and 2.4GHz Wi-Fi. DSLRs close like a photo experience with traditional exposure controls that are fitted with lenses and bodies. The next feature is DFD Technology (Depth From Defocus). This feature instantly calculates the distance to the subject. You do this by evaluating two images with different levels of sharpness. So that it can achieve fast auto focus. Besides that, 5.5 fps burst shooting with the AFC to help when taking pictures. This feature can capture the fastest photo opportunities. Additionally, it can perform 11 fps continuous shooting with AFS. Panasonic Lumix LX100 Mark II has a 1.040k-dot 3 inches touch monitor. So, it allows low-angle shooting or selfies. In addition, this touch electrostatic panel also allows to choose focus point. The Auto Marking Function helps choosing the best shots more easily. The camera detects human movements or faces and automatically sets a marker to increase creativity. So, can adjust the results of 4K photos and do Post Focus. Sequence Composition helps us making the 4K PHOTO feature even more creative. Unique composite photos can be produced by synthesizing several 4K PHOTO images. This camera carries a new micro four-thirds sensor. Lumix LX100 Mark II has 20 megapixels resolution. It’s just like the sensor on the Lumix GX9 mirrorless camera. The maximum resolution is limited to only 17 megapixels. This is because Panasonic applies the multi-aspect ratio mechanism with the technique of cropping images for the LX100 II. The same multi-aspect ratio mechanism is also applied in the first generation Lumix LX100 Mark II. So, this camera has an effective 12 megapixel resolution from a 16 megapixel resolution sensor. It also includes a dial to select the shutter speed and exposure compensation. The electronic part of the viewfinder also does not change. That is 2.76 megapixels resolution (field sequential). Like the previous series, the Lumix LX100 Mark II still uses the Leica lens. This lens has no doubt in its performance. With f / 1.4 at wide angles and f / 2.8 at narrow angles. So, it can give the good result images. The combination of the 24-72mm sweep lens is suitable for a variety of situations. It is good to shot from still to landscape to portrait photos. In addition, the camera can also performs very detailed macro up to 3cm wide. Panasonic Lumix LX100 Mark II has a slim and thin appearance. So that it will be comfortable when inserted into a pants pocket. Plus the advanced features that are owned. Lumix LX100 Mark II is very easy to use. So it is suitable for those who do not want to miss important moments. Some pro photographers might like this camera because, this camera has photos in RAW format. Besides, it also has manual and auto modes. The quality of the camera and lens are classified as very good for pocket camera classes. So are you interested?